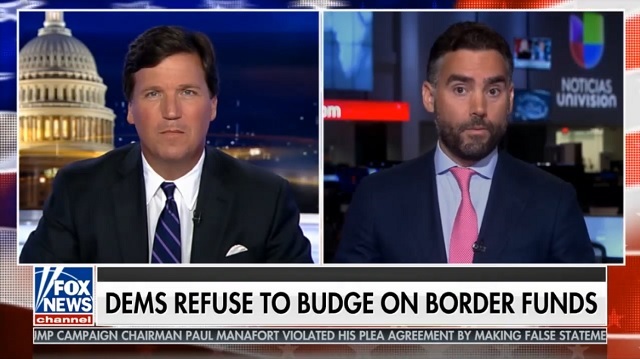 Univison anchor Enrique Acevedo told Tucker Carlson on Friday night that a US border wall is "immoral" but Israel's border wall is just fine. "I think it's immoral because what it represents," Acevedo said. "The signal that it's trying to send, division, hate. It's trying to somehow paint the [United States] as an isolationist country, as a country who doesn't want people to come here. And that's not who we are and how this country was founded." At the end of the interview, Tucker asked Acevedo, "Real quick, is the Israeli wall immoral? Does that send a message of hate?" "Is the Israeli wall along the West Bank line is that immoral too, does that send a message of hate?" "I think that's a different circumstance, right, because they were being threatened by a very real possibility of terrorists coming to their country and you can prove that by the building that wall they've been able to reduce that threat considerably, so it's a different circumstance." "It's a good thing!" Tucker exclaimed while laughing. "There but not here!" Univision is owned by billionaire Israeli-American Haim Saban, a Democrat megadonor who famously told the New York Times in past, "I'm a one-issue guy, and my issue is Israel." No doubt that has zero influence on Acevedo's position!